The girls have really been having fun playing in the snow while we've been off for Christmas vacation. They're going to be disappointed when the visitors stop coming, we go back to work, and life gets back to normal around here after the holidays! 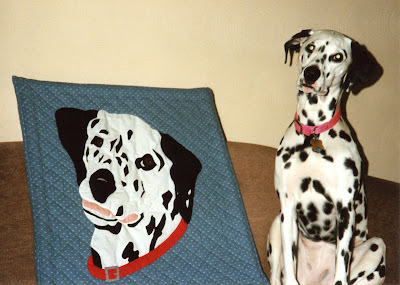 For Christmas of 1990, when Dottie was our only Dal, my sister made me a quilted wall hanging featuring our spotted girl. It was a cherished gift and still hangs in our house today. I remember Dottie fondly each time I see it. 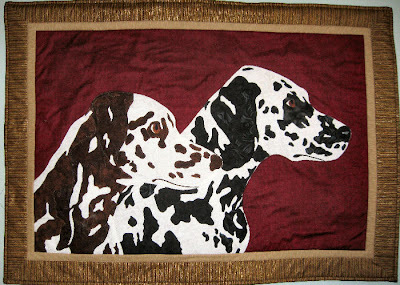 Imagine my surprise this Christmas when Carol gave me this incredible wall hanging of Tess and Jazz! 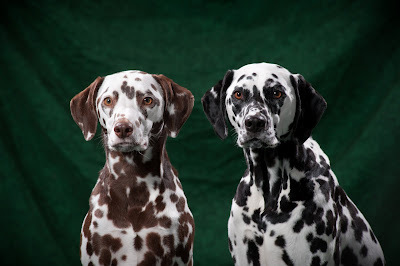 She says her skill set has improved a bit since 1990, but she wishes we'd get another breed of dog...all those Dal spots just drive her crazy!! 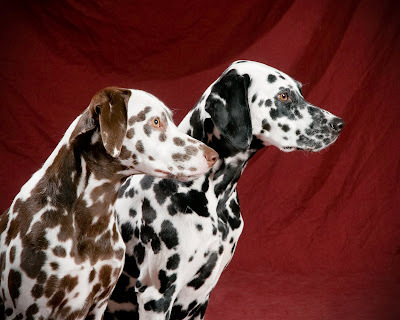 Of course, it doesn't help that we have very spotty dogs, even by Dalmatian standards! Here's the photo that Carol used to create her pattern for the wall hanging. Amazing likeness, isn't it? And believe me when I tell you that the photo above doesn't do justice to the actual piece itself. We've visited Christmas Past and Christmas Present, so now it's time to take a peek at Christmas Future. Meet Ryan, my 7-month-old great-nephew! Ryan is the first baby in my family in nearly 30 years, so imagine how we'll spoil this handsome little guy. At first, Tess and Jazz were very curious about this new "toy" who came to our house, but Ryan is such a pleasant baby and they warmed up to him very quickly. Welcome, Ryan! I'm sure our future Christmases will be a lot of fun with you in the family! From Christmas Past to Christmas Present...or should I say Christmas presents! Here's a few pics of Tess and Jazz opening their Christmas gifts today, despite the fact that they were still a bit tuckered out from last evening's festivities! 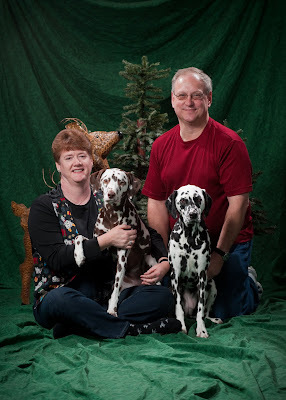 From our blog to yours, we wish you the merriest of Christmases and a happy, healthy New Year! This morning, we're taking a trip back to Christmas Past of 1994. 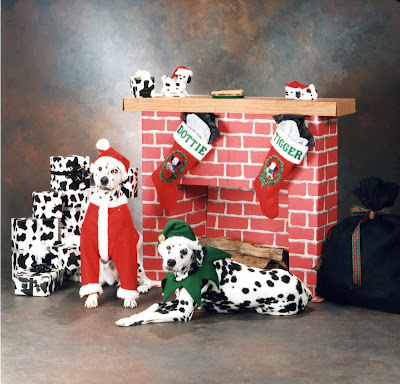 The adorable Santa and Elf in the photo above are Dottie (Santa) and Tigger (Elf). Dottie would have been six and Tigger was three. 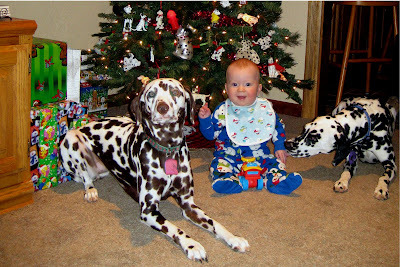 Even then, we had the tradition of Christmas photos of our Dals. My, how that has grown! We've gone from ordering a dozen cards to now ordering 100!! Every year, we can't wait to see the cards we receive...and this year was no disappointment. Thanks for all the great cards with photos of your pets. We wish you all a very happy holiday! Here are a couple photos from this evening's holiday pet therapy visit by Jazz and Sammie to UPMC Passavant Hospital. These two definitely spread some holiday cheer among the patients and staff tonight! We took our annual trip to Pittsburgh Mills Mall to see Santa tonight. This event is becoming more popular every year and the lines were very long, but Tess and Jazz did well. I was especially proud of Jazz, as there were a lot of dogs in a relatively crowded space, and she handled it all quite well and never stopped wagging her tail. I think she was trying to impress upon Santa what a good girl she is!! Santa was in the midst of a woodland scene, and Jazz was very interested in all the animatronic critters, including this bear in the tree! 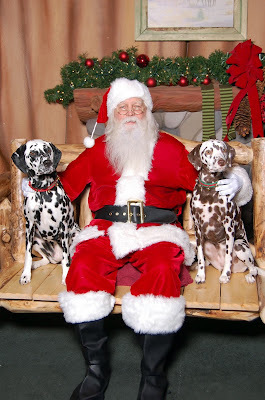 Tess and Jazz can rest easy tonight, knowing that they got to visit with Santa and tell him what they want for Christmas and let him know that they've been very good girls again this year. Ho, ho, ho! Since October is Breast Cancer Awareness month, the folks at Westmoreland County Obedience Training Club invited "Spot a Cure" to participate in their Doggy Fun Day today. Here's Jazz and Tess in front of our table, where we sold t-shirts to benefit breast cancer research and awareness. It was a very chilly day, even for early fall here in PA. Tess and Jazz were sporting their new purple sweatshirts, along with their pink ribbon bandanas and pink pigtails! Part of the Fun Day included a costume contest. Since Jim was too embarassed to be seen with either Tess or Jazz in costume, Jazz got to participate with her Grammy King and won second place in the "Cutest" category. Gotta love my little pumpkin!! Tess donned her Elvis costume and took first place in the "Creative" category, as well as best costume overall. Thank you...thank you very much! Elvis Lives!! The Westmoreland Club put on a nice event, and we're grateful to them for allowing us to attend and raise funds through "Spot a Cure." We'd also like to thank our blog friend Kim from Florida for holding a contest on her Facebook page and making a generous donation to "Spot a Cure." Lastly, just a reminder that we do still have t-shirts available. Hop on over to http://www.spotacure.com/ and check them out. We're also hoping to have sweatshirts available soon. Support this great cause and help us Spot a Cure for breast cancer! It was quite a weekend for Tess and Jazz, even though it was a rare instance where we divided the troops and went in two different directions! Jazz and I went to Rally, with a third place qualifying score yesterday and another qualifying score today to earn her Rally Advanced title in three successive times in the ring. I was very proud of my little brown girl, who seems to really enjoy Rally. We've got a bit of work to do before stepping into Rally Excellent, but in the meantime, I'm going to work with Jazz and Tess together with an eye towards Rally Pairs, where I'd run both girls together on the Rally course! Talk about seeing spots!! In the meantime, Tess and Jim went off to USDAA Agility, where Tess earned her Performance II Standard and Performance II Pairs titles with two first place qualifying runs and thus completed her Performance Dog II title. Tess also qualified with second place in Performance III Snooker and took a first and fourth placement. Here's Tess with her whopping Performance Dog II title ribbon. There's a lot of polyester in the Bauer household this weekend!! We are very blessed to have two girls who work so well for us and have opened up new adventures and friendships through Agility and Rally. Tess and Jazz had quite a successful weekend! On Friday, we started out with Jazz at AKC Rally Obedience at Westmoreland County Obedience Training Club. Jazz ran her first Rally Advanced class and qualified with a very nice score of 94! Then it was off to USDAA Agility with Splash 'n Dash K9 Sports. Tess had four first place qualifying runs, a second place qualifying run, a first, two second, and a third placement, and her Performance II Gamblers title! Whew! Needless to say, the girls were quite tired today after their weekend adventures! Jim also got to rev up the Ferrari again when he ran Sammie, our friends' Border Collie. Jim and Sammie had an awesome third place qualifying run in Masters Standard that was a joy to watch. Once Mariann is well again, I'm not sure Jim will want to give back the keys to her little red Ferrari! !